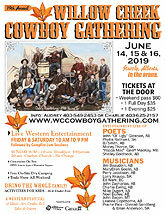 The Cowboy Gathering Committee invites you to the foothills cowtown of Stavely, AB for its' 20th annual weekend of fun, fellowship and great Western entertainment, summer 2019. The complete event will be held in the Arena where free, onsite, dry camping is available and the acoustics are superb. The weekend Schedule of Events will include music, humour, tall tales, vendors offering handmade leather goods, jewellery, pottery, picture frames and much more. The Silent Auction table is fun and winners may carry away treasures either whimisical or practical. jam sessions boss, Noel Burles, will again be on hand Friday and Saturday evenings to keep the jam sessions going smoothly.